Compact Laminate is constructed with layers of Kraft paper, dipped in resin and dried. These layers are then sandwiched between laminated top and bottom sheets, compressed and baked. A process called polymerisation melds them all together creating a solid- core panel that is an extra tough durable laminate. This creates a prefinished panel that is strong, self-supporting, water resistant and highly durable, requiring very low maintenance – perfect for a multitude of uses in commercial and public spaces. This means that Compact Laminate is perfect for virtually unlimited interior uses and the benefits of choosing Resco are clear, and significant. It can be used vertically or horizontally for toilet and shower cubicles, wall panelling, lab benches, tables, office furniture, lockers, in fact almost anything. Many colours are available in larger 1850m x 3670m panels. Also available is a range of ‘designer’ colours that are useful if you are after something just a little bit unique! WHY IS COMPACT LAMINATE SO GOOD? 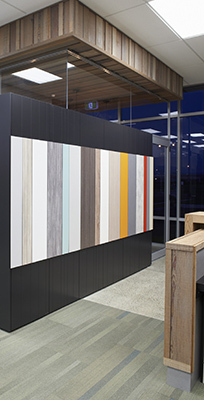 Compact laminate is perfect for virtually unlimited interior uses. It can be used vertically or horizontally for toilet and shower cubicles, wall panelling, lab benches, tables, office furniture, lockers, in fact almost anything. Being a tough durable product it can take the knocks a lot better than other options, making it a smart, cost effective choice. It’s perfect for ‘high traffic’ locations and because it’s impervious to water, is ideal in wet areas. And Resco’s Antibac Compact Laminate panels have the additional benefit of containing innovative silver ion Biocote technology that continuously destroys bacteria for the lifetime of the panel. Being a prefinished product, once it’s installed there’s nothing else to do – no filling, sanding or painting. And as for cleaning it really is low maintenance and most things can be washed off with soapy water. Even most graffiti can be removed without damaging the panel. All Resco’s systems come with a 10 year guarantee on panel integrity and 2 year guarantee on hardware.